Our global society faces complex health challenges such as infectious diseases, lack of access to food and clean water, pollution, and the impacts of population growth and climate change. 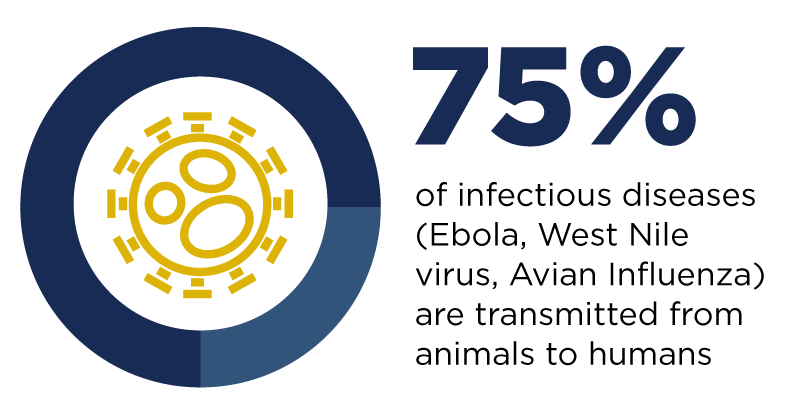 The One Health approach to solving these global health challenges recognizes that the health of humans is linked to the health of animals and the environment. Understanding the interactions between them is essential to protecting the health of all. Gorilla Doctors, a partnership between the UC Davis One Health Institute’s Karen C. Drayer Wildlife Health Center and the nonprofit organization Mountain Gorilla Veterinary Project (MGVP, Inc.), works to save endangered wild mountain gorillas in east-central Africa through direct, hands-on veterinary care in their forest homes. Did you know that human and mountain gorilla health and survival in Rwanda, Uganda and DR Congo are intimately linked? They are susceptible to the same pathogens, and gorilla tourism supports the local economy, which in turn preserves the forest. Using the One Health approach, Gorilla Doctors also provides park workers and their families with preventive health care, to help ensure that the people who come into contact with gorillas every day are as healthy as possible. A recent census of habituated mountain gorillas in the region shows the Gorilla Doctors’ efforts are working. There are now 1,004 mountain gorillas left in the world (previous count: 880). The veterinary care provided by Gorilla Doctors is credited with approximately half of this extraordinary growth rate. Pollution of coastal waters, much of it plastic and human-caused — threatens the health of sea turtles, sea lions, waterfowl, whales and other marine species. A team at the Karen C. Drayer Wildlife Health Center’s Latin America Program, led by Dr. Marcy Uhart, works to protect aquatic life and create a healthier coastal environment for all. The team’s efforts to reduce marine debris in 2017 included a marine debris census, beach clean-up of 40,000 pieces of debris by more than 300 volunteers across 13 coastal towns near Buenos Aires, and a community workshop emphasizing behavioral and cultural change. Dr. Uhart’s projects in Argentina were recently highlighted by the Houston Zoo’s sea lion team, as part of its “spotlight on species” event in celebration of World Ocean Day, with proceeds supporting a second workshop. Kristin Burns, a campus communicator and UC Davis alumna, is content marketing manager for the One Health Institute.